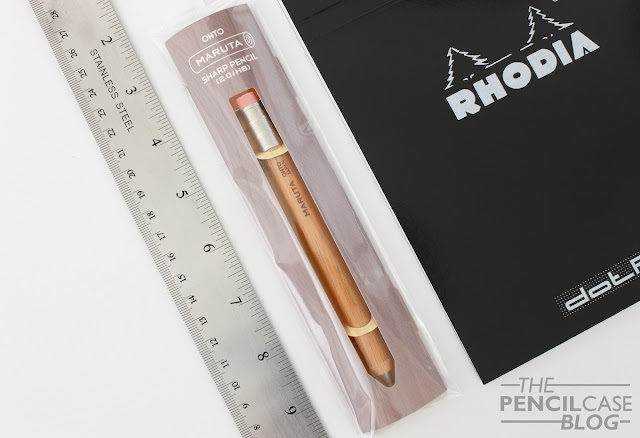 I rarely review pencils here (I probably should've picked a different name than 'The PENCILcase Blog'! ), but that doesn't take away the fact I can often enjoy a nice mechanical pencil, leadholder or even woodcased pencil from time to time! 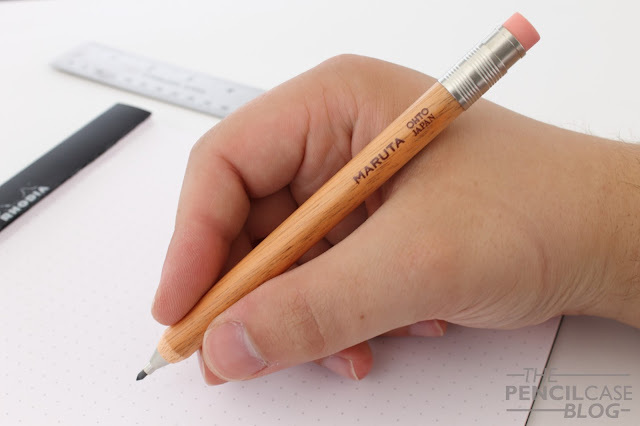 The one we're looking at today is quite an interesting one: the Ohto Maruta 2mm mechanical pencil! Thanks to Papier & Stift for sending it over! Why is it interesting? Well it's basically a mechanical pencil, disguised as a woodcased pencil. I suppose the reasoning behind this design is quite simply to create a different aesthetic. It could also be a sneaky way to trick die-hard woodcased pencil users into buying a mechanical one, although I doubt that? 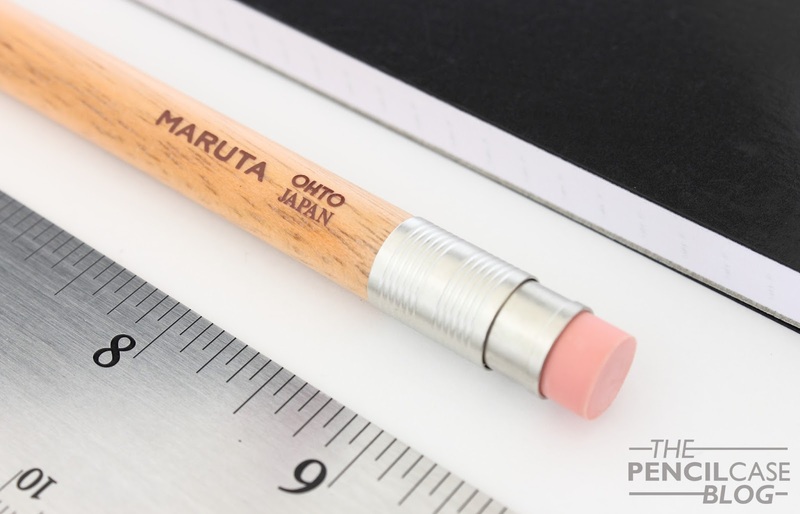 The Maruta, which is Japanese for 'log', looks and feels like a generic jumbo-sized woodcased pencil with a round profile, silver ferrule and pink eraser. But push the eraser, and a 2mm pops out from the front! For a 10$ pencil, Ohto put a surprising amount of effort in the details. This genuinely looks like a woodcased pencil from afar. All the metal parts are nicely machined and have a satin finish. The tip of the pencil is actualy 'sharpened' into a cone, which transitions into the metal tip. The wood received a clear coat of laquer, and the brand and model name are stamped in brown paint near the ferrule. The overall product is simple and clean, just like the average #2. 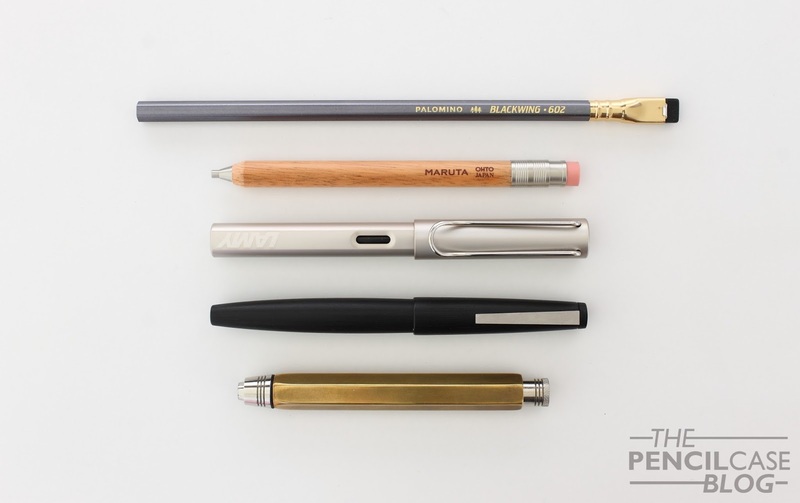 Top to bottom: unsharpened Blackwing 602, Ohto Maruta, Lamy Lx, Lamy 2000, David Hayward hexagonal leadholder. In terms of size, the Maruta is short for a pencil, but normal sized compared to other pens or mechanical pencils. It measures 13.6 cm (5.35") without the lead extended. 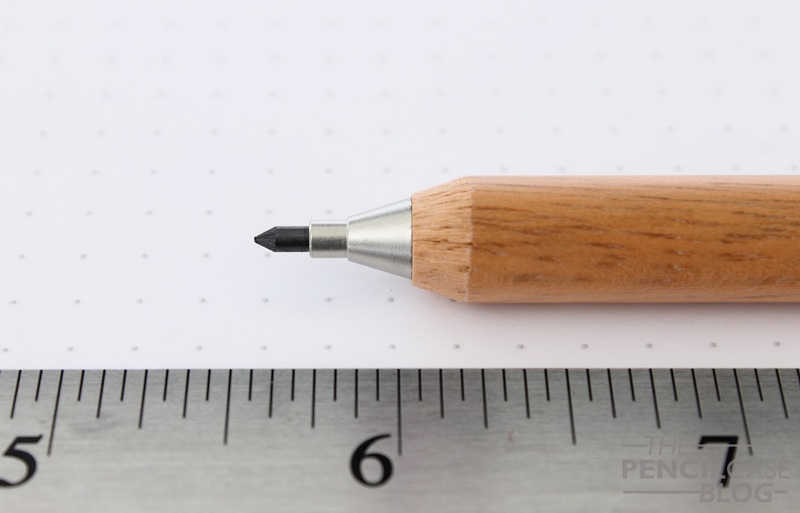 The diameter of 1 cm (0.39") is comparable to the dimensions of a jumbo pencil, which makes it easier and more comfortable to grip than a normal woodcased pencil. It's lightweight, but not as light as a pencil due to the metal parts at the front and back of the pencil (It's slightly back-weighted, but not to the extent where it's actually noticeable in use). The wood has a very nice, smooth satin finish. While this is nice to look at, it's a bit slippery in the hand. As I already said, the machining on the metal parts, such as the 'ferrule' is actually really nice, especially for a 10$ product. Everything fits nicely, but the metal push button does rattle quite noticeably. The button can be pulled out to refill leads (or you can just push a new lead in from the front), and the eraser can be replaced. The knock mechanism advances the 2 mm lead by approx. 1.5 mm each time. The lead has little to no play inside the metal tip. As far as the writing goes... The choice of 2mm leads is useful for drawing or sketching but I also like to write with pencils like this because the leads are available in a wide variety of grades (I prefer HB or B for general writing, a balance between smooth, dark lines and point retention). 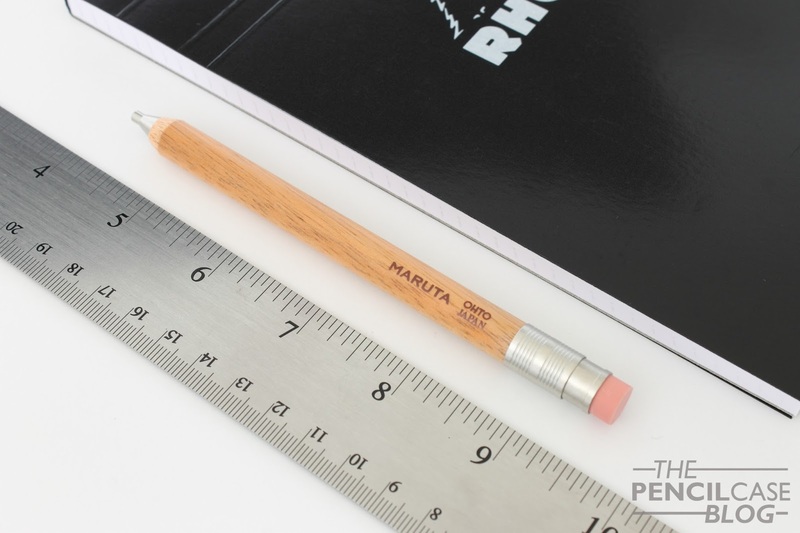 The Maruta comes with one HB lead in the pencil, which I found kind of soft for HB, and rather dark. I swapped it out with my favourite 2mm lead: Staedtler Mars Carbon HB. Of course there's plenty of other lead options, you could even get some coloured leads in this size to play around with! 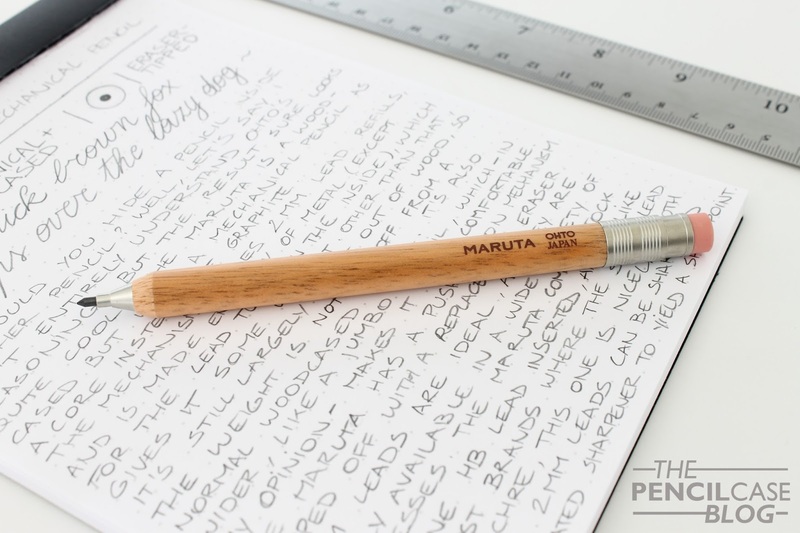 For just under 10 euros (via Stift & Papier) which translates to about 12.5 USD), the Ohto Maruta is a fun pencil that won't break the bank. It's very well made (Japanese quality! ), especially given the price. And I like that it takes 2mm leads, which is something else from the usual 0.5mm mechanical pencils. Note: This product was provided by Papier & Stift, free of charge, so I could write this review. I was in no way influenced in the making of this review, the opinions shared in this review are completely my own! This post does not contain affilate links.